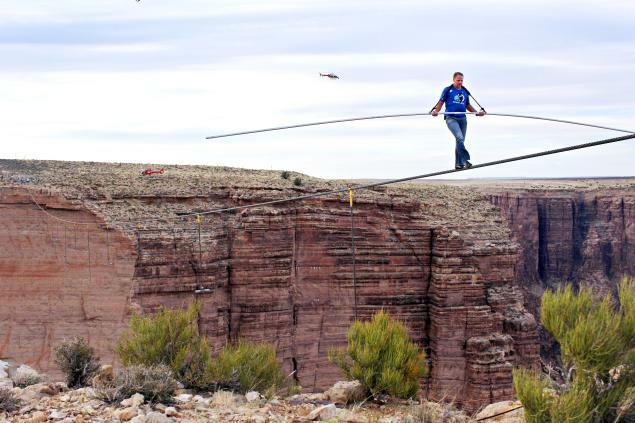 I wasn’t going to watch Nik Wallenda’s skywire walk over the Grand Canyon. I just didn’t have it in me. I have a ferocious fear of heights, and the thought of what he was going to do drove me into a dizzying tailspin. A few years ago while visiting my Aunt Joan and Uncle Stan in Cave Creek, Arizona, they surprised me with a trip to the Grand Canyon. It made me excited and anxious all at the same time. But the thought of the impending trip made me weak with anxiety. How was I really going to experience this majestic place without having a major panic attack. Small cliffs and bridges made me weak. How would I manage to look out and down into these enormous canyons? As we drove the car up the road to the canyon, my heart pounded in my chest, and I was fraught with anxiety. I thought about asking them to drop me off at one of the souvenir shops along the road and pick me up when they were finished. But I couldn’t. They were so excited to show me this magnificent place, and I knew I couldn’t disappoint them. We walked to the edge of the first lookout point. Rather, they walked out, and I stayed back a safe distance, stealing quick glances and then looking away. Words cannot describe the beauty and awe of this sacred place even with my fleeting glimpses. But my heart once again started palpitating too fast, I started to sweat and had the overwhelming feeling of falling. I turned and walked away. I looked for the nearest souvenir shop and browsed until they were ready to move on. That’s how most of the day went. At each lookout site, I took a quick peek and then retreated. I felt like a weirdo. How I survived the day I’ll never know. In the end, I wanted a picture of me with the canyon in the background and stopped at one of the picture points, but instead of moving forward to it, I turned around and inched carefully backwards. Then I had the sensation of falling backwards down the canyon, but they took a quick snap before I retreated. At the end of the trip a lightning storm appeared over the canyon and flashed brilliant zigzags through the crevices. I watched in awe. It was just overwhelmingly beautiful, and I was sorry to have been such a dope. Fast forward to today and to Nik Wallenda’s skywire walk. I’m not watching that! I stated emphatically to anyone who would listen. How could he do such a ridiculous thing? Is he crazy?!?!? The fact was, I couldn’t bear to see him fall, reenacting my biggest fear. But when the time came for the show, I somehow couldn’t change the channel or turn away. His family and he prayed at the beginning with Joel Osteen, who is my all-time favorite evangelist. I watched as he prepared. I watched as he took the first step on the line. My heart started pounding. He started to pray aloud. I love you, Jesus. Guide my steps, Lord. You are the King of Kings. Tears started rolling down my face. I started to pray with and for him. He continued…Steady this cable, dear Father. Calm this wind. Calm me. Use this for Your own glory, Lord. Thank you, Jesus. I stayed with him. I couldn’t look away, even though the sites were dizzying. I couldn’t turn the channel. I watched and listened as Nik’s father encouraged him through his earpiece and couldn’t help to think that was just what God does as we face our own challenges. He calms our fears as we trust in Him. I saw the fear on Nik’s face, but he kept moving forward. I saw him look down and watched with him as he commented on the beauty below him. Nik Wallenda is a shining example of a true man of great faith. God was guiding him, and it turned out for me to be a learning lesson in faith and trust. I’ll never forget the overwhelming feeling of bravery as he prayed and trusted in God to guide him to the other side. And then 22 minutes and 54 seconds later…he finished the 1,400 ft. walk, touching ground on the other side. I watched as he hugged his wife and children. I watched as he went off for a few minutes by himself with his head bowed, tears streaming down his face, certain he was giving thanks to almighty God. And I couldn’t help but cry as I also gave thanks to God for keeping him safe. When I heard Nik say…Use this for Your own glory, Lord…I believe that is exactly what happened. I can’t help but think that many people who were watching were touched by his great faith. I know it renewed my own in a way that makes me feel stronger for the fears that I will face in the future…some that I can even see in the distance. Nik once said in an interview, “Danger was real but fear was a choice. What would happen if I chose faith instead?” And that’s exactly what he did. I will often think of Nik and his treacherous walk of faith with God as he trusted fearlessly in the guiding hand of our Lord. And by his example, I will pray and ask God’s grace and strength as I make my own way across the treacherous skywires that I encounter.